Living with Diabetes as a Senior - How companions and homemakers can help. Diabetes in seniors is more common than people think. According to EverydayHealth.com, 1 in 4 seniors has Type 2 Diabetes. When we think about senior health concerns we usually think about Alzheimer’s and mobility issues but Type 2 Diabetes is just as prevalent in seniors as those issues are. Living with Diabetes is manageable and there are many tips and support out there for seniors living with Diabetes. 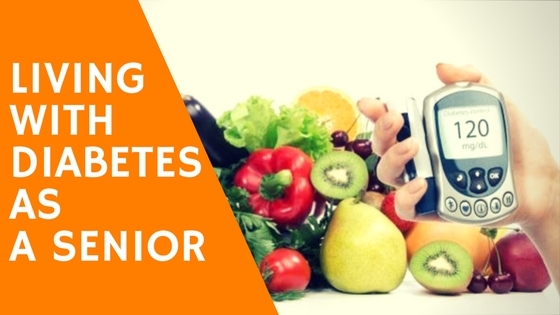 Meal preparation is key to managing diabetes as a senior. For a lot of older seniors, cooking and meal preparation can be difficult. Our caregivers are here to help seniors who are diabetic with grocery shopping, meal preparation, and feeding. We can help you prepare meals that meet your dietary requirements. You can find diabetic recipes that are quick and simple to make at the American Diabetes Association like Summer Chicken Spring Rolls or Tailgate Nachos. Staying active as a senior with diabetes can improve overall happiness, mobility, and can help keep your sugars down. Daily strolls are the perfect activity for seniors to do with Diabetes. Our caregivers can assist seniors with mobility difficulties with their daily walks. Getting some sun and fresh air is important for everyone’s well-being. We have more ideas for staying active on our blog. Checking your blood sugar levels and eating properly is the most important aspect of living healthy and happily as a senior with diabetes. We understand that keeping on top of your diabetes can be overwhelming at times, it’s why we’re here to help you with caregivers who can prepare meals, keep you active, and sustain your social life. Interested in Companionship and Homemaking caregivers?